Over the last few weeks I have been working on a project. Kind of a big one…rehabing 15 of my pocket style cloth diapers. 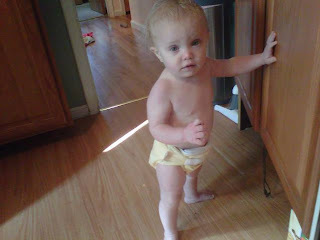 I was blessed enough to have a friend give me her stash of cloth diapers to use with Patrice. I have added a few items, but it kept nagging at me that there were a lot more of them that I was not using because the elastic was stretched out and they tended to leak. I follow a lot of cloth diaperers on twitter, so I started asking questions about rehabing them. One person clued me in that Cotton Babies, the makers of Bumgenius, sell a refreshing kit that includes new elastic, pre-cut, and new aplix (velcro), also pre-cut, for $1 a packet and they don’t charge shipping!!!! Another mama friend sent me a Youtube link for a video of someone fixing their diapers. I watched it many times. Finally, I started ripping out the stitches to get at where I needed to put in the new elastic. It was torture. I didn’t have a clue where to start. I got so frustrated. I broke a seam ripper. I called a seamstress friend to see if I could hire her to do it. Chickened out from asking her. Kept at it. Picked a different diaper to try…Bingo! Got one opened up. Then to sew. That part only took 10 minutes. And I had a wonderfully snug fitting diaper. Over the last few weeks I have continued to rip out stitches. Friday night I got all of them opened up. Saturday I actually got a couple sewn. Turn diaper inside out. Look closely at your diaper to see if there is a spot where the elastic is exposed. Those are the easiest ones to work with. See the loope of elastic sticking out? You rip out a few stitches at each end of the wasteband elastic. Maybe an inch or two at each end. Then rip out an inch or two of stitching at each end of the leg gussets. When all is said and done, you will have exposed elastic at 6 places in the diaper. Snip off old elastic where you started exposing it. 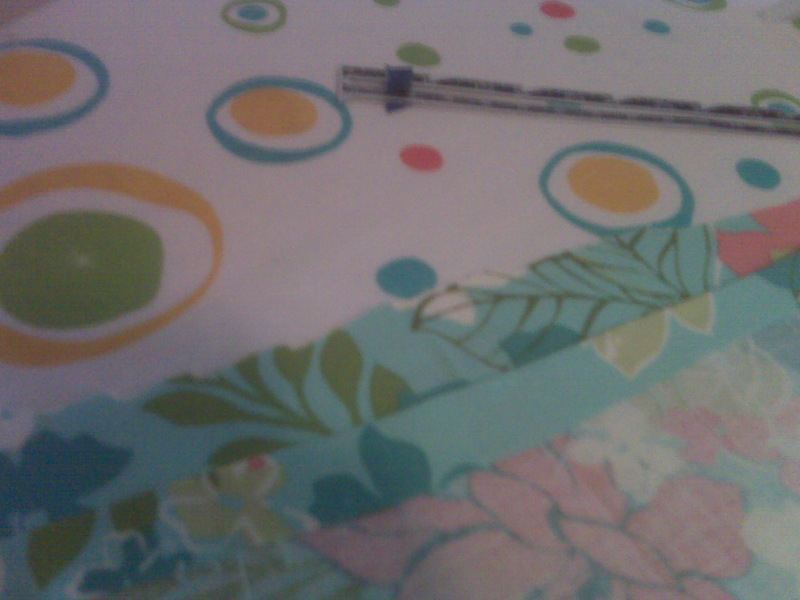 Then sew the new elastic on to the diaper where the old is showing or started. Pin the unsewn end of the new elastic to the cut end of the old. Go to the opposite end of that gusset, pull on the old. It will pull the new in and through. Make sure it goes in flat and doesn’t twist. Cut old elastic off, sew new elastic on. Repeat on other side. Sew seams shut. 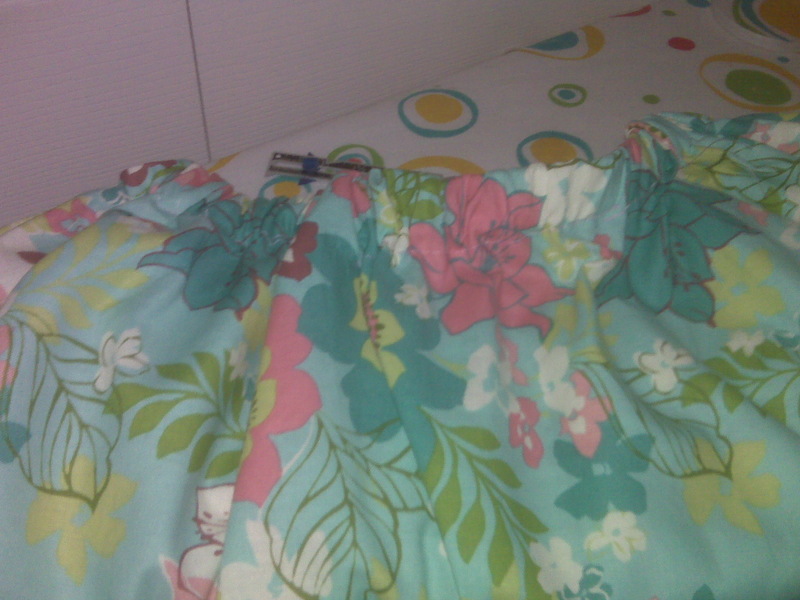 Try not to sew the elastic as that will reduce it’s stretchiness. Next, turn diaper right side out. Rip stitched out of old elastic side tabs. Sew one of each of the sides of elastic to it’s “partner”. Just sew the rounded part, leave the bottom open so you can sandwhich the diaper itself. Finish sewing the tab onto the diaper. Sew the square laundry tabs over the old ones. The new ones are bigger and the old ones are SOOOO sewn on, just covering them is your best bet. Look at your beautifully rehabed diaper! See Patrice sporting her rehabed diaper? You should see the proud mama!!! Check out other posts here and here. I was a little hesitant to get involved with something I heard about on the internet, but that didn’t stop my heart from responding as they shared what the Lord was calling their family to do, and I knew the Lord was calling me to join in. Next month I will begin asking you to join in with me. I have volunteered to be a point person to collect obstetric/birthing supplies for Mercy House. Please let me know if you have any contacts that could help with items such as Medical supplies-gauze, band ages, Latex gloves, Clamps for baby’s umbilical cord or string, Polythene draper –clean pads for delivery, vitamins, blood pressure cuff, stethoscope, tylenol, etc. In the meantime, I made a tunic style dress. This will go to the home for one of the girls to wear during her pregnancy. You all have joined me in my sewing journey, so you know my skills are somewhat limited, but I try. And with each project I learn something. With this project I learned the fabric amount listed was about half of what was actually needed. Then, three times, I learned to rip out stitches in order to make the elastic lay flat in the collar. It kept getting twisted right at the end of pulling it through, ugggghhh. And I learned, the author of the pattern should get a proofreader. The patten is full of typos, but that is neither here nor there. What new things are you trying? 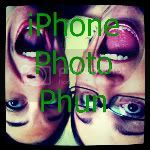 Join my blog hop and let me know! Here we are, another Wednesday. Last week there was not a works for me wednesday in honor of Thanksgiving, but it has now returned! I am by no means a super-duper seamstress, but I have made several baby wearing wraps (think Sleepy Wrap or Moby Wrap). I thought today I would share how I make mine. Maybe you have a new mama in your life who would love one for a Christmas Present. My original was a gift to myself. Best gift ever! The edges of your wrap fabric should curl under when stretched. There should be some give, but NOT as much as a t-shirt fabric. I prefer a stiffer fabric. This is enough material for three wraps. Cut the fabric length wise in 17-20 inch wide strips. Cut the ends rounded to make it easier to tie the wrap on.Technically you do not have to sew the fabric I use, but I choose to stitch around it to give a nice finished look. The key feature of the wrap is something to mark the center. 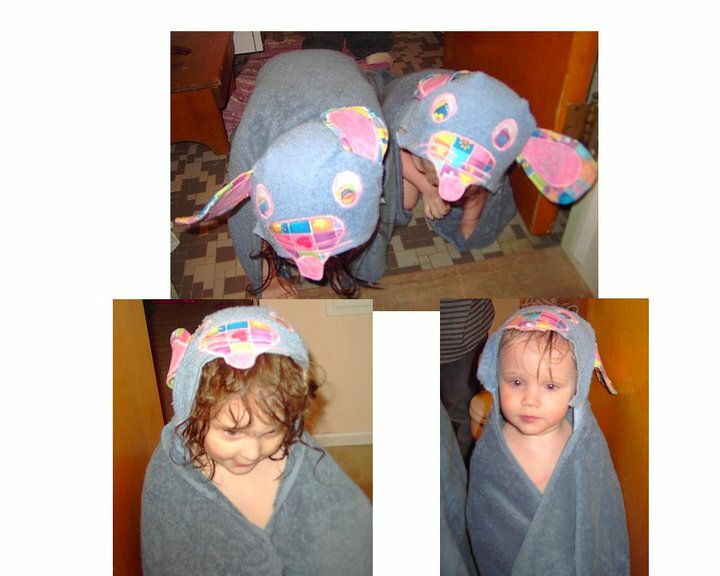 So fold your wrap in half, so the ends are lined up, and sew either a pocket on the center with the opening on the side you want to be “up”, toward your head, or I prefer to pick a fun baby fabric and cute a cute shape out of and sew it on. You need to be able to find the center easily to tie the wrap for baby wearing. If you choose to sew around it, get some water soluble or tear away stabilizer. Cut it in strips to place under the edge where you are stitching. Trust me, you will thank me later! I do not pin the fabric at all, just lay it under the fabric as you are sewing. Sometimes I do it all the way around, other times, I just do it at the beginning of sewing. I hope my instructions are clear, but if you could use more help, or pictures, check out this site. I love wearing my babies (or stuffed animals!). With this wrap you can start wearing them from birth on, there is no weight minimum. The basic wrap instructions are the same for almost any hold. Center the decoration you chose to add at the wrap middle, across your belly.bring the fabric ends over each shoulder, creating an X. Tuck the ends of fabric under the fabric in the front, again creating an X on the front. Pull the ends around the waist to the back and tie. If you have lots of fabric, bring it back to front before tying and make the knot in the front. You Tube has lots of videos on how to tie the wrap. 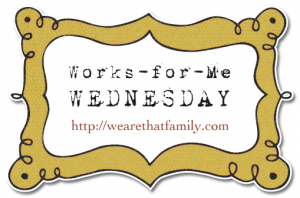 I hope this gives you some idea of how to make a wrap and what works for me this wednesday! Now head on over to We Are That Family for more holiday or gift ideas. Now hop on over to An Ordinary Mom and see her photos! They are SUPER cute!!!!!!!!!! 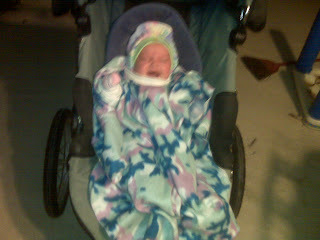 And here is a picture of little Miss Patrice getting ready to go running with mommy. She is buried in projects from mama. A snow sack I made when expecting Sue (my very first project on my own) and a wearable blanket I made originally for Sue, but she never really wore it. I think Patrice might get more use of it jogging with me. 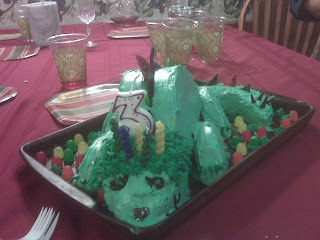 Here is daddy’s creation of a birthday cake for Sue (she will be 3 on Sunday). Isn’t it awesome?! I am getting back into the swing of things. I am working on coming out of a turtle time in life…you know, those times you just don’t want to communicate as much as you normally do. And I am coming out just in time to enjoy Indian Summer. It is supposed to be 65 degrees today. If Sue would get dressed, we would be outside right now, but she doesn’t seem interested. While hanging out in my shell, I made a couple photo books of my girls. I got a great deal on one from Shutterfly, so I made one for me to take to work when I go back. Then Snapfish had a great deal, buy 1, get 2 free; I made one for me and two of my family members will get one for Christmas. I love Snapfish. They ship super quick and I love the option of pre-buying my photo prints. Do you have a favorite photo website? Here is one photo that made it into both photo books. Way too cute to leave out! 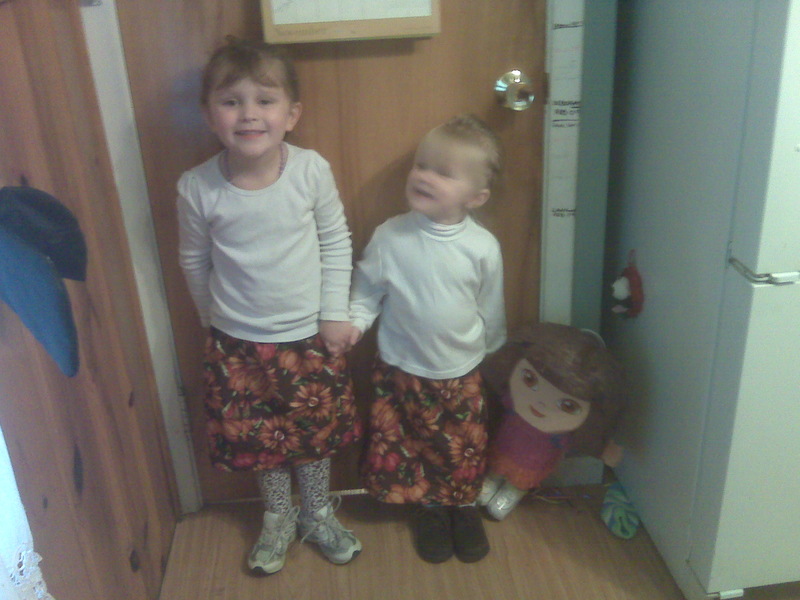 The girls and I went shopping the other day. I had a gift card and coupon for Macy’s. They had a great sale and the jeans that fit me, so off we went. I got a shirt and jeans for under $25 at Macy’s. Yup, you read that right! Anyway, as we were leaving, Caitlyn said, “I thought you were going to take us to JC Moneys!” Can you guess the moneys are kids get the most often–pennies!!!! See how that worked in a 4 year olds brain? Yesterday I was starting a sewing project. 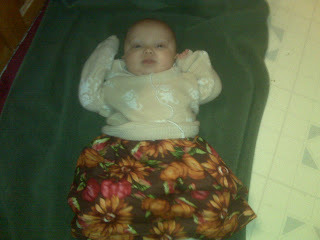 Caitlyn was visiting with me as I pinned out the pattern. “What 3 boys?” I asked. “The 3 brothers I want,” she said. The other day the girls and I went to our local Farmers Market. I have lived here over 6 years now and just went this weekend. Yes, I know it is the end of the season, but ours is open year round and I did get some yummies. My midwife passed on her mom’s acorn squash recipe. It was yummy. I had never had, nor cooked it before. It was yummy, I also got a sweet dumpling squash (daughter loved it, mama and daddy, not so much). And if you are wondering, purple cauliflower turns the water purple when you steam it. It tastes great. Tonight we are going to have acorn squash soup. Wish me luck with that recipe. I have a burning question…why will my daughter listen to what someone else tells her, but when daddy or I tell her something, it takes a million tellings to sink in? Remember this post about Caitlyn’s first trip to the dentist? At that visit, the hygentist told her not to eat sticky candy, like fruit chewies. The child has not touched them since, not even once. And she often asks me if the dentist said she can eat something or not. How do they have so much power and where do I get it? Caitlyn went for her latest check up last week. All is well! 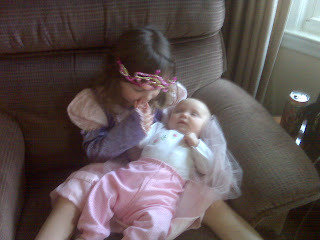 As you know, I think my kids are really cute, and I am slowly teaching myself to sew…and today on http://www.sewbaby.com/ facebook page, they featured both. Sewbaby is a mom/daughter home based pattern and sewing material company. They are currently celebrating their 16th anniversary. As part of that, you can enter any item you make using one of their patterns or their materials, in their contest. For Easter I made the girls hooded mouse towels from one of their pattern books. 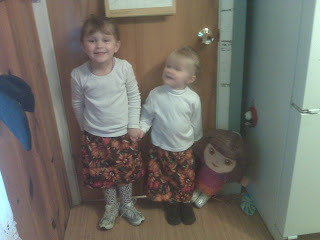 I sent pictures of my girls and did a review of the book on the website. They e-mailed me back to say they wanted to showcase the pictures. And today they did. So my little mice are on their facebook wall! I am so thrilled, 2 of my passions together–my girls and sewing.